A MIDI keyboard is a controller that is operated with piano keys and does not produce any tones, but only transmits control signals. The keyboard can be connected to the computer and controlled via USB connection. The keyboard is used as a DAW controller, for composing, or even, as many people do, for live performance on stage. 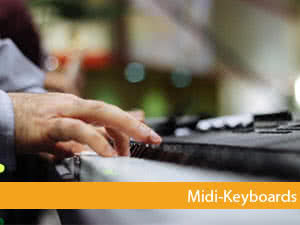 MIDI Keyboards are a sub-category of MIDI controllers that complement your equipment and bring out the best in your DAW. The MIDI keyboard also allows you to play software synths and other virtual instruments while you're really playing on keys that give you a familiar look and feel. A good keyboard is an essential part of modern production and should not be missing in any studio - no matter if it's home recording or professional studio. Midi keywords are available in different sizes, which are usually limited by the number of keys. The end of the food chain is 88 keyboards, which need the most space, but have the best and most authentic feel. In contrast, a 25-key keyboard can be placed almost anywhere, but is only suitable for playing simple bass or synth phrases. 25 keys: Suitable for playing light and uncomplicated melodies. Ideal for basses or simple arp synth lines. 37 keys: Also suitable for light melodies. The Transpart button (Octave + or -) can be used to make easier piano passages. Ideal for quick brainstorming, which does not take up much desk space. 49 keys: From here on, more complex melodies can be played without having to constantly change the octaves with the transport button. However, it takes up some space on the desk. Nevertheless, the ideal compromise between space consumption and playability. 88 keys: Based on a real piano. Interesting for the professional piano player or for people who take or give piano lessons and don't have the space for a real piano at home. A keyboard is available either as a complete package with drum pads and faders or as a complete package - completely Spartan with keys only. Especially Akai and M-Audio were the pioneers who started to extend normal keyboards with new features. The keyboard has not only become a great idea finder, but can also act as a complete control unit for all kinds of daws. In addition to the usual job of recording melodies, modern midi keyboards can now also be used to play complete drum sets and then mix them all by fader and knob. Everything on one device. 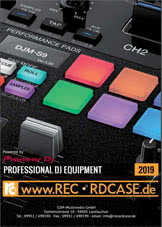 Native Instruments has gone one step further with its complete control series. These controllers work so closely with NI's proprietary software that extensive DAW control (e. g. machine software) is largely possible via the keyboard. In addition to passing on presets, for example, you can also scroll through sounds directly. The knobs have a display on which the most important parameters can be dynamically changed and manipulated, depending on the preset. The complete keyboard is equipped with LEDs that can display different colours - perfect for chords or to learn notes. In the past - when there was no USB - a keyboard had "real" midi inputs or outputs. Today, everything is transmitted digitally via USB. Practical and sufficient for most people. Simply connect the keyboard to your computer or MAC via USB, drivers are installed and BAM - it can be played. But those who still work with older standalone synths or samplers will enjoy physical midi outputs and better yet inputs that most modern keyboards still offer. However, the power supply via USB is no longer necessary and a power supply unit must be used, which is usually never included in the scope of delivery and is only available as an accessory. MIDI-OUT: The output for connecting the keyboard to another MIDI device, such as a synthesizer. If you want to buy a keyboard, there are usually two other terms that often stand out: velocity dynamics and weighted keys. These two factors have a major influence on the keyboard's feel and therefore these points are often the subject of heated debate - also because they are very subjective and every pianist has his or her own idea of good playable keys. Indicates whether the keyboard of the keyboard is "touch-sensitive". If the keyboard is only lightly touched, the sound is also only soft. If you press the button harder, the sound will be played louder. The gradation is 127 steps. 1= very quiet, 127=very loud. Almost all available keyboards on the market are velocity sensitive. In most cases, the intensity can be controlled by drivers or the software and adapted to his needs. Indicates whether the keys react sluggishly and build up a certain counter-pressure. With weighted keys, the stroke can be adjusted more easily and finer nuances can be played. Cheap keyboards usually have no weighted keys, but can also be played with a bit of practice and acclimatization very nuanced. The compromise is a semi-weighted key that is weighted down with small weights to give you a better feel for playing. Weighted keys are mostly found in expensive professional keyboards and are often found in the 88-key variants to give you the most authentic playing feeling possible. As mentioned above, the requirement of each individual to a keyboard is decisive here. One only wants to play on 88 heavy buttons, the other one gets along better on 25 keys mini keyboards. In case of doubt, the only thing that helps is to try it out and find your personal keyboard.